Standard Straight Tubes – Ideal for Retail, Office space and industrial applications. T9 Fluorescent Circular – Suited to specific light fixtures of circular design, usually found within homes. Our low ceiling, LED luminaire lighting offers a huge range of options, including three types of fixtures, six types of lighting units and 6 colour temperature options, meaning we’re bound to have the option that’s just right for your environment. *This is the average figures in changing electric power by Initial Illuminance Correction. For more information on the Hitachi range, download our brochure and contact Hitachi Australia for more information at the details below. Introducing our range of LED Luminaire lighting, designed specifically for industrial and/or commercial applications such as warehouses, manufacturing plants and for either exterior and interior use. Our LED high-bay lighting is designed to replace both existing Metal Halide and Mercury lamps with a much more efficient, longer lasting and cost saving lamp. Average luminous flux(lx) 608 627 Brightness 103% approx. *This is the average figures in electric fluctuation by initial illumination correction. 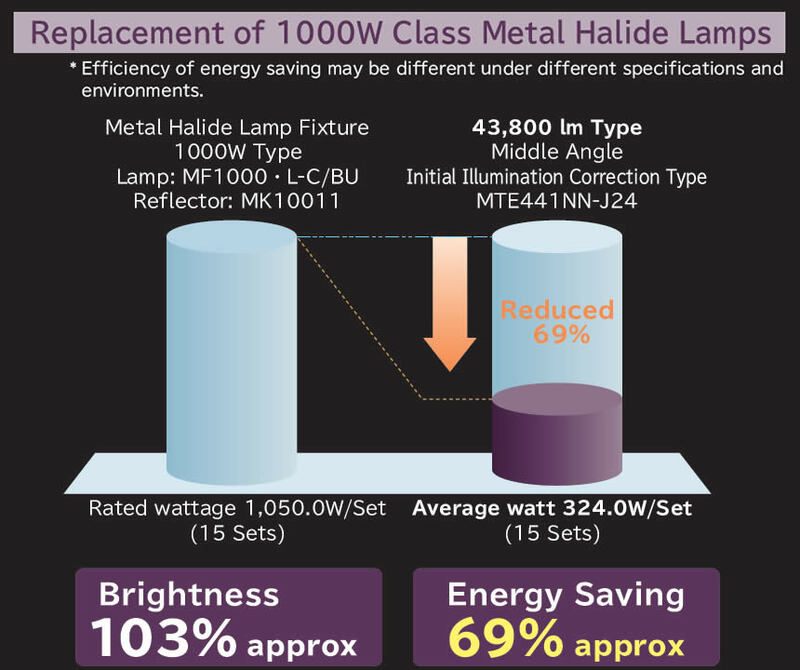 This is comparison of Fixture used: 1000W class of Metal halide lamps fixture (Lamp: MF1000.L-C/BU Reflector: MK10011) (Energy consumption 1,050.0W, Average luminous flux 608 lx, Maintenance factor rating 0.47) x 15 sets used and LED High-bay luminaire 43,800 lm type, Middle angle, Initial illumination correction type MTE441NN-J24 (Average energy consumption 324.0W, Average luminous flux 627 lx, Maintenance factor rating 0.75) x 15 sets.